The North Pennines covers the area from the A66 motorway north to Hadrian's Wall country. The summit of the Pennines is to be found on Cross Fell which is also the highest point in England outside of the Lake District. With the exception of the central portion of Hadrian's Wall, which was designated part of the Northumberland National Park in 1956, it was not until as recently as 1988 that the North Pennines was designated an Area of Outstanding Natural Beauty (AONB). It was the 38th AONB in the UK to be created and at 772 square miles is the second largest. North Pennines Gallery: Click on the photos below to enlarge. The underlying rock is made up of the typical Pennine mix of gritstone and limestone. Geological matters are complicated by the additional presence of the Whin Sill a sheet of rock formed from dolerite over 295 million years ago. The Whin Sill stands out fairly prominently along the western and northern parts of the North Pennines and helped form some of the areas finest features including High Force, High Cup Nick and slightly further north the crags that form the central section of Hadrian's Wall. In Upper Teesdale the Whin Sill transformed the limestone to create a rock called 'Sugar Limestone' which in turn created the soils that produce flora that is unique to Britain. Due to the rare nature of this plant life the North Pennines was designated as Britain's first UNESCO-designated European Geopark in 2003. Unlike the southern Pennine regions there are relatively few population centres of any great size in the vicinity of the North Pennines. The main towns of Alston, Allenheads and Middleton-in-Teesdale are all fairly small. While certain areas once saw a great deal of mining man's presence is also a lot less in evidence than some Pennine areas. The North Pennines features numerous high roads that link the main valleys of Teesdale, Weardale, East & West Allendale and South Tynedale. The highest tarmaced road in England is the access road to the radar station on the summit of Great Dun Fell. The North Pennines can with some justification be described as one of the last great wildernesses in England, a place where huge swathes of high moorland seem to stretch on forever. A lot of the moors are managed for grouse shooting and few summits could be reached using public rights of way. 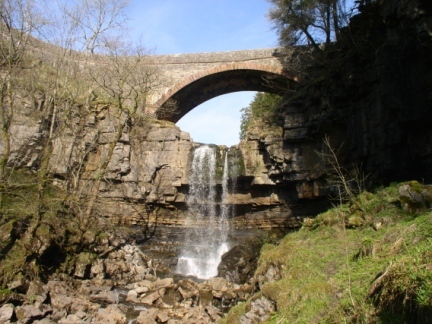 The Countryside Rights of Way (CRoW) Act has therefore opened up huge areas of the North Pennines to adventurous walkers. There are however still some areas that are hard to access including the Ministry of Defence owned Warcop Training Range which covers much of the south west region of the North Pennines including (and most regrettably) Mickle Fell, the historical summit of Yorkshire. Away from some of the more popular features such as High Force and High Cup Nick it is possible to walk for miles without seeing a soul. This is great if you enjoy solitude but it is also worth bearing in mind that if an accident should befall you then don't count on anyone happening by to help out. My own experience is that the North Pennines provides some of the roughest walking conditions in the country but this is offset by the sense of liberation gained from being in such a remote area. Almost the entire length of the Tees within the AONB is a sheer delight and provides some lovely lower level walking. Meanwhile the East Fellside in particular features some great walks and fantastic views across the Eden Valley.